The Hmong began migrating from the central and southern parts of China into Laos in the19th century. Today, they inhabit the northern and central parts of Laos, including Xieng Khouang, Luang Prabang, Oudomxay, Luang Namtha, Xayaboury, Vientiane and Bolikhamxay provinces. Many Hmong villages can be found around Vang Vieng. The Hmong have their own spoken and written language, and constitute the third largest ethnic group in Laos, with about 8% of the population. 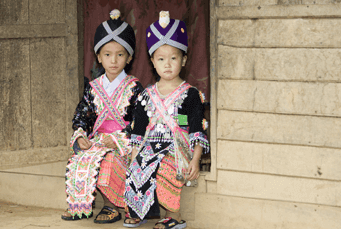 In the past, the Hmong used to be called the Miao or Lao Soung. Lao Soung means “Lao of the mountaintops.” The expression refers to where the Hmong traditionally liked to live. However, these names are no longer considered appropriate, and the Hmong prefer to be called by their ethnic group name. The Hmong are a proud ethnic group, maintaining their distinctive culture and traditions. They cannot marry within their clan, or even a person of their own family name. This means that men and women often have to find a spouse from outside of their village. Traditionally after marriage, a woman will then follow her husband and sever ties with her parents. Hmong women are well known for their embroidery skills and batiks. A Hmong batik, made of hemp, is painted with beeswax, then dyed with indigo. The beeswax is then boiled off to reveal a white pattern. Each group has its own traditional costume. Nowadays, the traditional clothing is worn only on special occasions, like wedding ceremonies and New Year. The Hmong celebrate their New Year, called Nor Pe Chao, in December or January, following the lunar calendar. The celebrations last about 10 days and include many activities, such as top-spinning games, arrow shooting contests, singing and dancing, and courtship games. Young men and women will wear colourful traditional clothing on these occasions, in the hope of attracting a life partner.